Is This Marvel vs. Capcom 3's Newest Challenger? No sadly, not the monkey man. 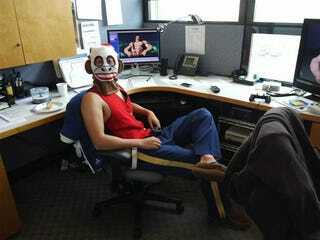 A photo from Capcom's office Halloween hijinks (above) shows Mike Haggar on a monitor. The Final Fight character looks like he's in a stage from the forthcoming Marvel vs. Capcom 3. .
Marvel vs. Capcom 3 features an array of character from the Marvel universe and Capcom's games. Haggar, a wrestler turned mayor, made his first appearance in the 1989 beat-'em-up Final Fight. He popped up in Namco x Capcom and in the backgrounds of various Street Fighter games. He isn't currently officially slated to appear in next year's Marvel vs. Capcom 3: Fate of Two Worlds. No word yet whether he is playable in the game. Capcom characters appearing in the game include Resident Evil's Wesker, Okami's Amaterasu, Arthur from Ghost'n Goblins, Resident Evil's Chris Redfield, Street Fighter's Chun-Li and Ryu, Dante and Trish from Devil May Cry, Morrigan and Felicia from Darkstalkers, Bionic Commando's Nathan Spencer, Tron Bonne from Mega Man Legends and Viewtiful Joe from Viewtiful Joe. Kotaku is following up with Capcom to confirm whether Haggar is appearing in Marvel vs. Capcom 3. This post will be updated if the company comments.